During the Christmas Holidays, I always start out with a list of cookies I’d like to make, and this year was no different. I always bite off more than I can chew, and I never end up making all the ones I set out to make. I really wanted to make the classic thumbprint cookies that are rolled in nuts, and filled with jam, but it just didn’t happen this year. So, when Julie Deily from The Little Kitchen made a call to participate in a Valentine’s Day themed drive for Cookies For Kids Cancer, I jumped on the opportunity! Not only did I know exactly what I was going to make, but the cause is a noble one. Cookies for Kids Cancer, in a nutshell, has funded 80 childhood research grants which resulted in 32 treatments now in clinical trial that are available to kids NOW. That’s pretty amazing. It started when 2-year-old Liam Witt was diagnosed with childhood cancer in 2007. His parents started Cookies for Kids Cancer when they realized that because of a lack of funding, there were scarce treatments for pediatric cancers. They wanted to do something about it. So, here we are, raising awareness! Did you know that cancer is the #1 cause of death by disease in children in the U.S.? There are 40,000 children battling cancer in our country, and I actually happen to know one of them. Not much funding gets to them, which is why we are raising money today. 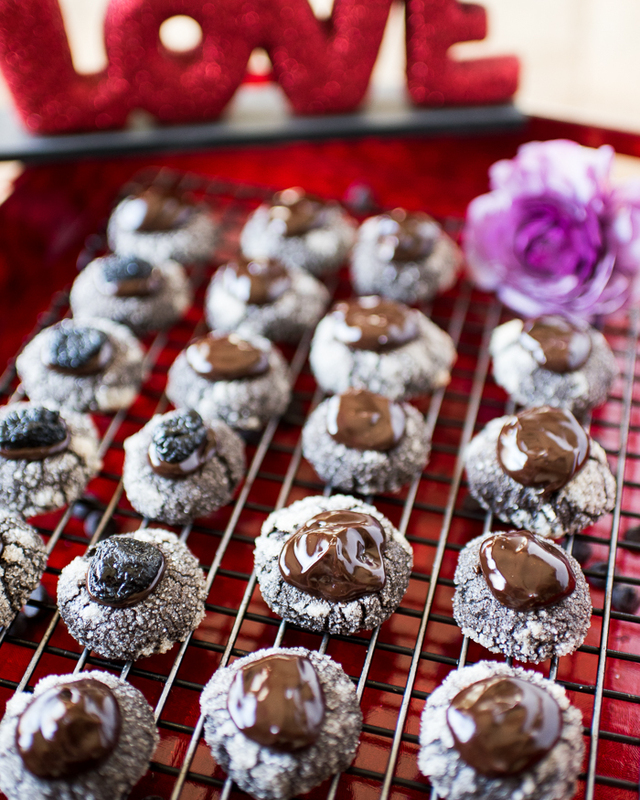 And you get a totally adult Valentine’s Day cookie recipe too. 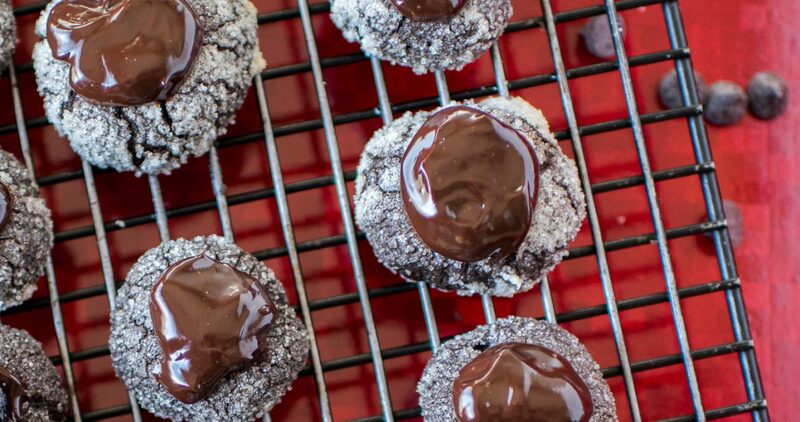 So, while you make this totally yummy double chocolate covered cherry thumbprint cookie for your loved one, please consider donating to Cookies for Kids Cancer. That would actually be a pretty awesome Valentine’s Day gift, if you ask me! 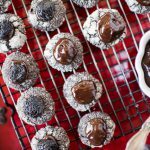 Decadent cookies paired with a donation to kids cancer in your loved one’s honor! So here’s the deal. For every dollar that gets donated, Dixie Crystals, Land O’Lakes and Mediavine will match it up to $3,000! That’s a potential for a total of $12,000, and for a grassroots campaign, that’s a pretty impressive number. In a time of uncertainty, you can be certain that this is going to an extremely worthy cause – one that helps preserve the future of all us humans on the planet! Much love to you all, and I sincerely hope you enjoy this extremely decadent recipe! Cream butter and sugar until the butter is pale in color, about 2 minutes in a stand-mixer. Add in egg yolk and vanilla until everything is well incorporated. Sift the cocoa powder and flour before measuring. Use a knife to make level measurements of both, and add each to a medium sized bowl. Add the salt, and whisk all the ingredients together. Add the dry mixture to the wet ingredients, and mix until everything is incorporated, scraping down the sides of the mixer bowl. Line two baking sheets with parchment paper or silicon mat. 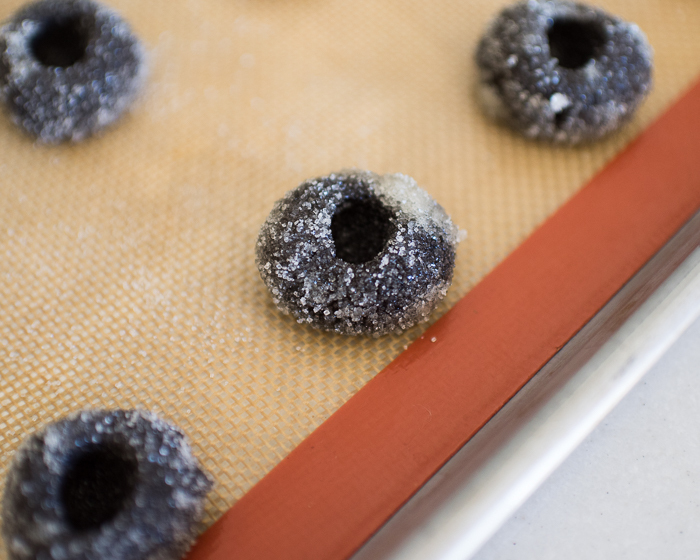 Form the dough into 1" balls, and roll in granulated sugar. Place on baking sheet, and use your finger to make a depression in the cookie. Don't depress so much that you end up touching the baking sheet. Bake in the oven for 10 - 12 minutes. Remove from the oven, and depress the cookies again. Sometimes in the cooking process, the thumbprint will raise a bit. Immediately remove to a wire rack to cool. Heat the cream in a small saucepan over medium heat until you see bubbles forming around the edges of the pot. Do not let the cream come to a boil. Add the chocolate chips to a small bowl. Pour the hot cream over the chocolate chips, and let sit for one minute. Using a whisk, mix the cream and chocolate chips together until smooth. 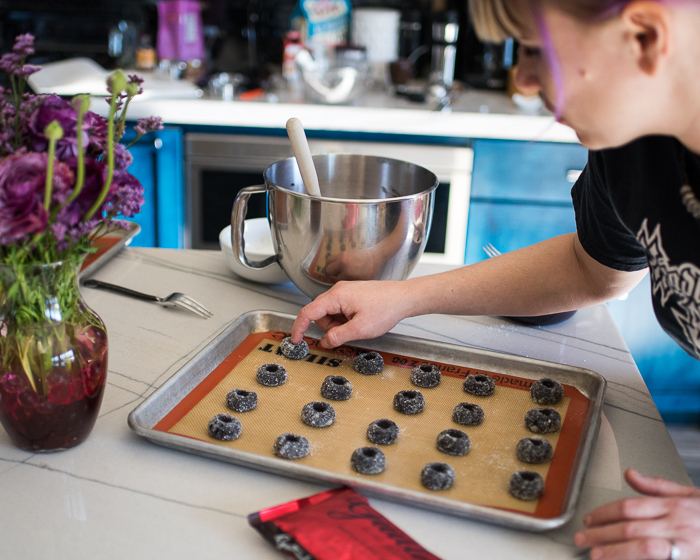 Place one dried bing cherry in each of the depressions of the thumbprint cookies. Top with 1 teaspoon ganache, so that the cherry is completely covered, and the ganache touches the actual cookie. You want to cover the cherry completely, and have it secure in the cookie, so it remains a surprise for the recipient! For the exceptional decadence that these cookies have, use Hershey’s Cocoa Special Dark, and Guittard’s Extra Dark Baking Chips. 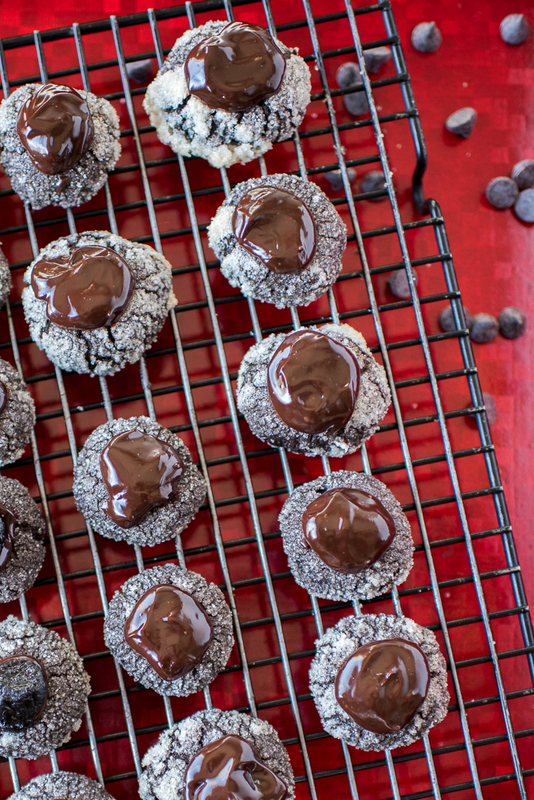 You can use regular cocoa powder, and milk chocolate chips with no problem as well! There were a few bloggers who participated in this event! 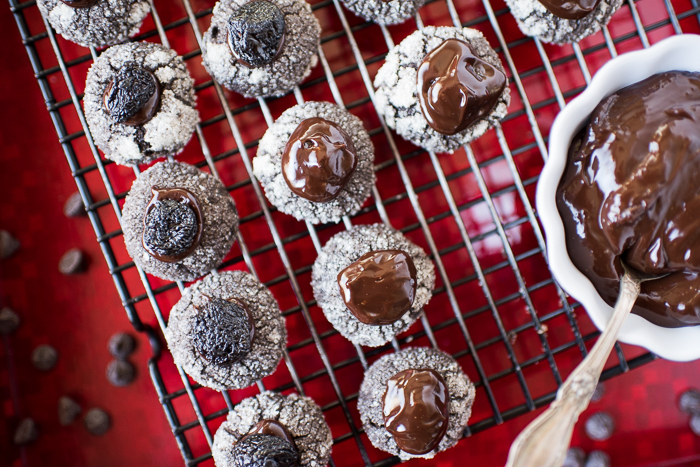 Here are their equally decadent and awesome recipes! Previous Post: « Breakfast Pizza! Thank you for your kind words, Gwynn! They are as amazing as they look – pinkie swear! Oh yum! I’m definitely gonna have to make a batch of these! They are as beautiful as I’m sure they are delicious! Thank you Sue!!! I think I’m going to be making many of the cookies from today’s post this weekend. But first – BUTTER! You had me a double chocolate! 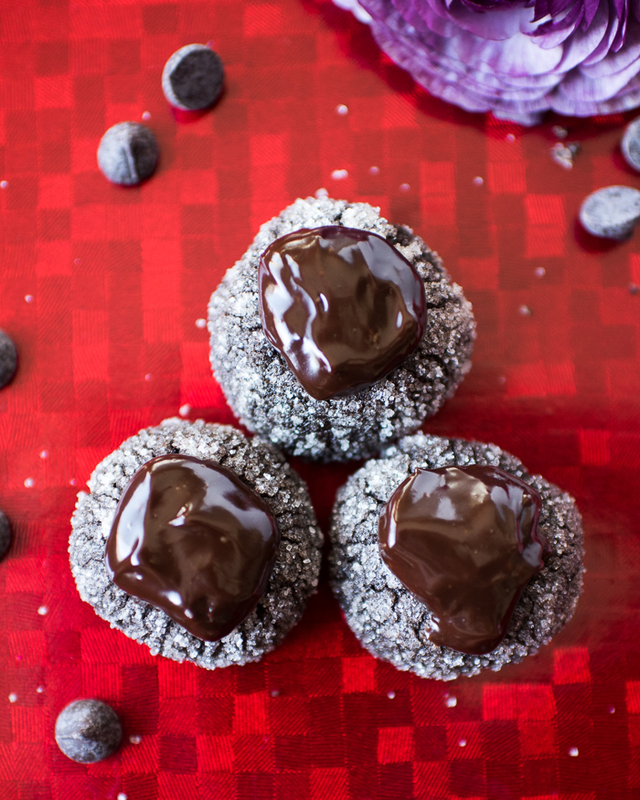 I’m totally making these next time my chocolate cravings hit. Gorgeous cookies! I’d always request for a black forest cake for every birthday growing up. Just love that chocolate and cherry combination. So, these are just the perfect ones for me. I do too, Maria! I hope you enjoy them. Double chocolate?! Yum! These cookies look heavenly. Thanks for sharing your recipe! Thank you for your kind words, Julie!! 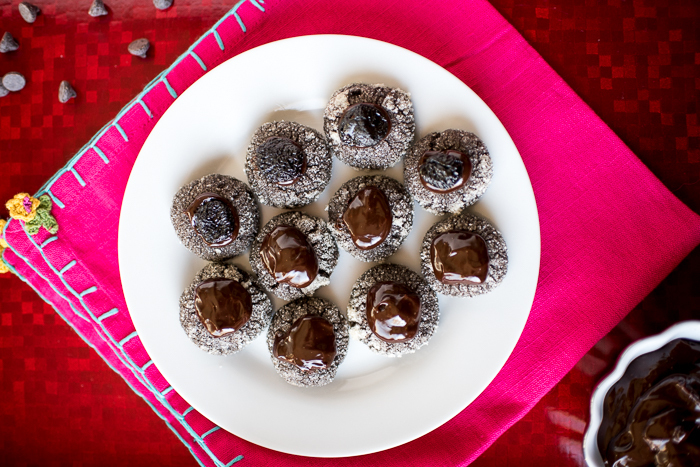 I LOVE the combo of chocolate and cherry!